Mars has fascinated astronomers, science-fiction writers and would-be space adventurers alike for well over a century, but until now the love affair has been skin deep. That’s set to change on Monday when a small spacecraft dubbed InSight touches down on the Martian surface with the goal of illuminating the planet’s poorly understood interior. Scientists say the data it gathers over the course of a two-year mission will provide clues to how Mars formed and evolved and help reveal how Earth, in comparison, came to be so uniquely hospitable to life. If InSight survives its screaming, seven-minute descent through the Martian atmosphere – during which it will decelerate from a cruising speed of about 20,000 kilometres an hour to a full stop – it will become the eighth spacecraft to operate on the planet’s surface and the first since the much bulkier Curiosity rover set down in August, 2012. Flight engineers at NASA’s Jet Propulsion Lab in Pasadena, Calif., say that, so far, InSight is heading for a near bull’s eye in terms of its preferred landing site on the flat, and largely featureless, Elysium Planitia. The location, about 600 kilometres north of where Curiosity set down, offers little in the way of dramatic panoramas, but it is well-suited for a spacecraft that is designed to stay in one place and focus on what is going on under its metal feet. 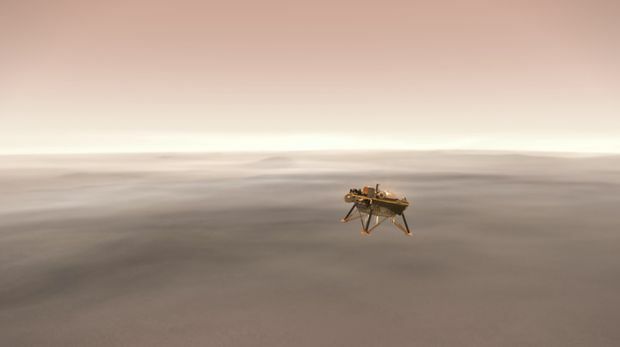 InSight, short for Interior Exploration using Seismic Investigations, Geodesy and Heat Transport, is designed to give the Red Planet its first thorough checkup since it formed 4.5 billion years ago. The spacecraft includes a seismometer sensitive enough to pick up the rattle of meteorites striking the planet’s surface thousands of kilometres away and potentially listen in on the faint murmuring of a planetary core that may not yet be entirely cold and dormant. 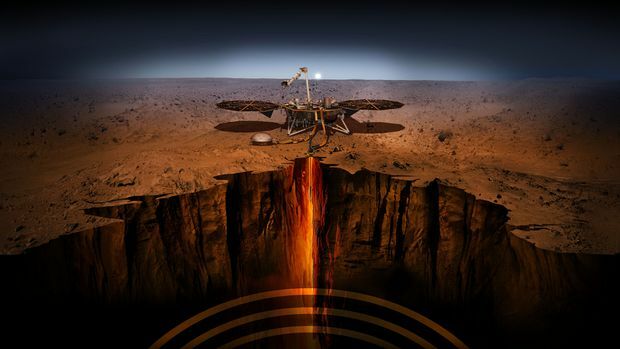 InSight also carries a spring-loaded mechanical mole that will burrow its way four and a half metres below ground in order to measure heat and electrical conduction through the planet’s crust. Beyond a few shovel scrapings, no previous mission has explored below the planet’s surface. The measurements InSight gleans will serve to reveal the size and condition of the Martian core, as well as the layers above it – all key pieces of information that will help shed light on the very early Earth, most traces of which have long since been obliterated by our own planet’s more dynamic geological history. “It’s so exciting to be nearly there,” said Catherine Johnson, a planetary scientist at the University of British Columbia who is participating in the mission, which launched in May. Like her colleagues, Dr. Johnson had to wait an additional two years while the mission was delayed by a technical problem. As long as InSight finds itself alive and ready to begin its mission on Mars next week, she said, it will all have been worth it.